Made from renewable resources, polylactic acid (PLA) is considered biodegradable. A lot of questions surround this type of plastic: Can PLA break down in natural composting conditions? Why isn’t PLA readily available on the market? Can I use PLA to make a biodegradable version of an existing product? Such questions got us thinking, and we decided to answer them ourselves through a series of comparative studies. 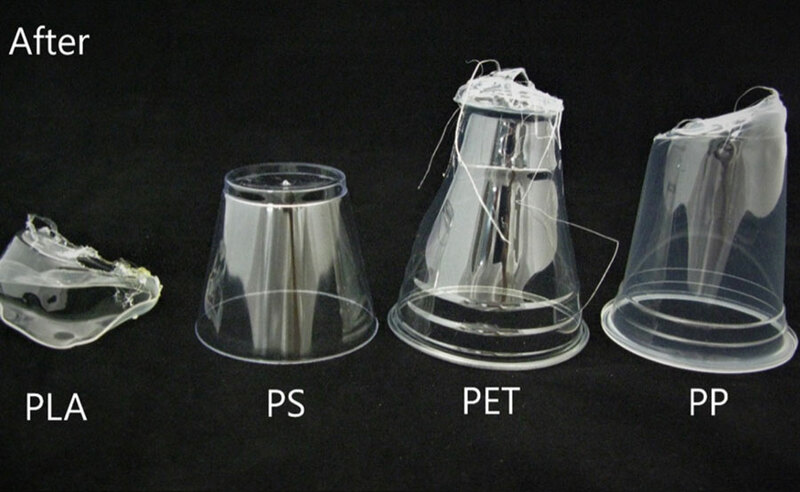 We decided to compare PLA to other frequently used, commodity plastics like polypropylene (PP), polystyrene (PS) and polyethylene terephthalate (PET) to see how durable and degradable PLA is in comparison. 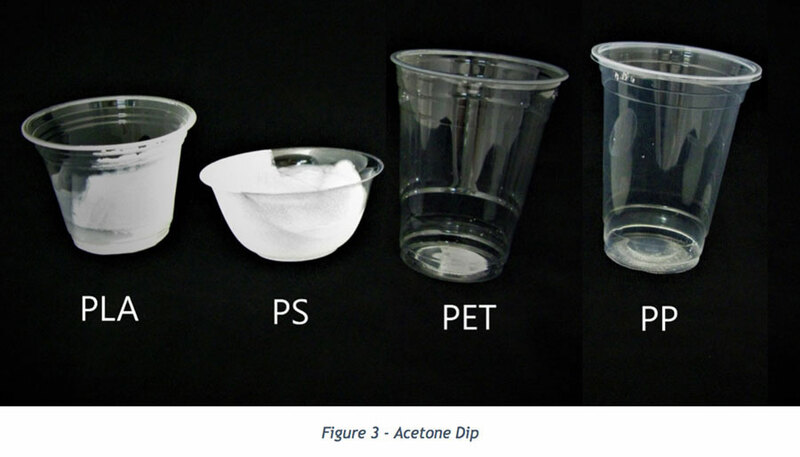 We used easily acquired testing samples: disposable cups manufactured in one of the four materials. Every commonly used plastic has its strengths and weaknesses which you can learn more about here. In this experiment we tested several different and important exposures: temperature, chemical resistance, UV resistance, and degradability. These exposures were inspired by day-to-day applications and different waste disposal methods. This experiment has two parts, short-term and long-term exposures. Short-term exposures include a heated car, acetone, microwave, heat deflection temperature, and hot coffee. Long-term exposures include ocean water, natural compost, direct sunlight, and soda. This article evaluates the short-term exposures. Later when the results are available, we’ll cover the long-term exposures. The interior temperature of a parked car in direct sunlight can reach up to 130° F to 170°F. The car acts as a greenhouse and traps the heat. To mimic this environment, we put all four cups inside a laboratory oven set to 150 degrees for eight hours per day for three days. 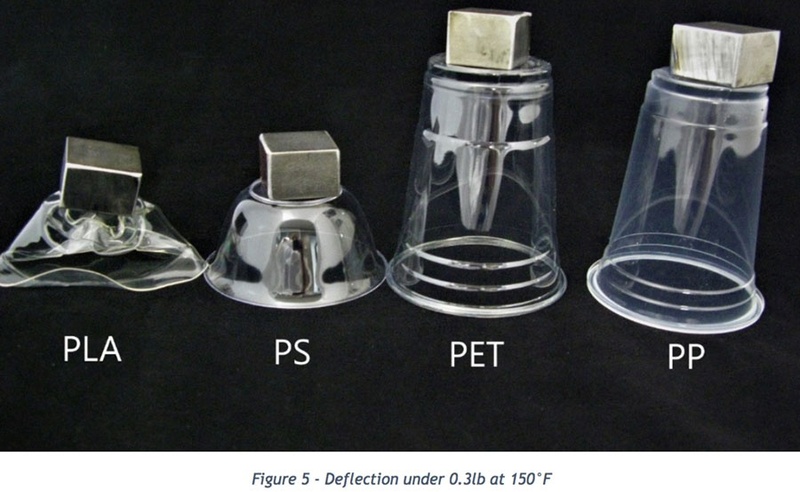 Figure 1, below, shows the PLA cup as the only plastic to experience any early changes. It continued to significantly deform throughout the test. 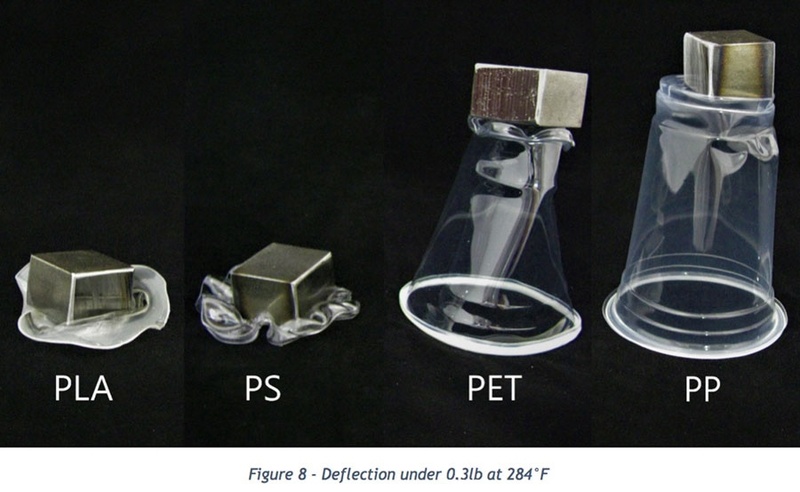 This is a direct result of PLA’s low glass transition temperature (140° F). 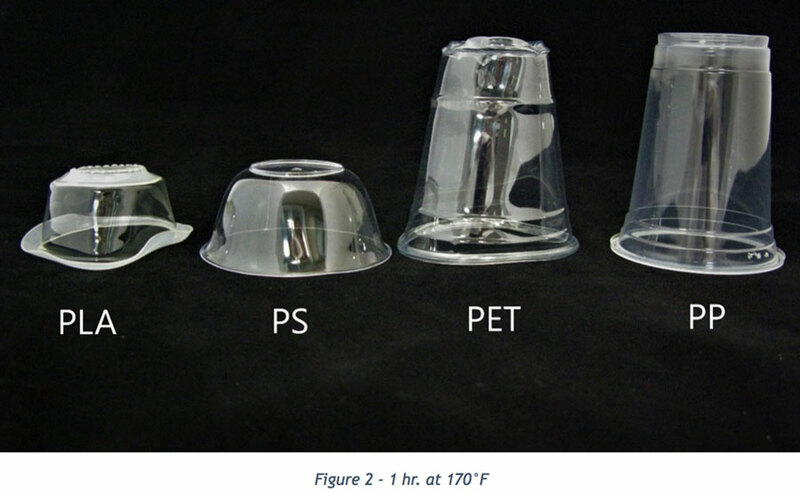 In addition to the PLA cup, the PET cup started to soften and warp at the bottom, also a direct result of its low glass transition temperature (152.6° F). 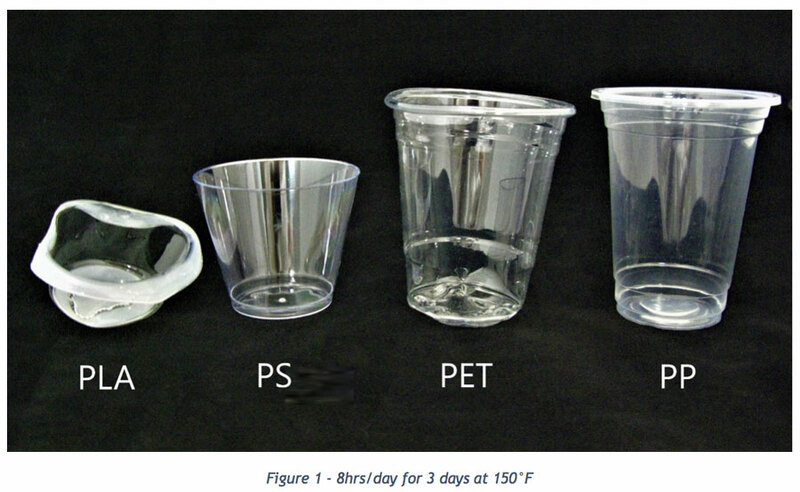 The two plastic cups with the highest glass transition temperatures, polypropylene (284°F) and polystyrene (212°F), showed no response to the heat throughout the entire test. Most disposable coffee cups are made of paper lined with wax or polystyrene that can endure the heat of its contents. A fresh cup of coffee fresh from a Keurig can reach up to 192°F. As seen in the video below, when pouring hot coffee into PLA, it instantly deforms to less than half its initial volume. The PP, PS, and PET cups show little to no response. Regardless of the results below, we do not recommend using a thin walled disposable plastic cup for hot drinks like coffee. A microwave oven uses electromagnetic waves to heat food to about 212°F. The optimal microwave time can range from one minute for reheating to as high as five minutes to fully cook. The most frequently used microwavable plastic container is polypropylene, because it will not warp or melt due to its high glass transition temperature. Each of the four cups was put into the microwave on a Pyrex® dish for three minutes. The PLA cup melted at the bottom and shrank to a quarter (25%) of its initial volume. The PET cup buckled and completely melted at the bottom. The PP cup melted at the bottom likely due to its contact with the Pyrex dish and its thin wall thickness. The PS cup showed no change. 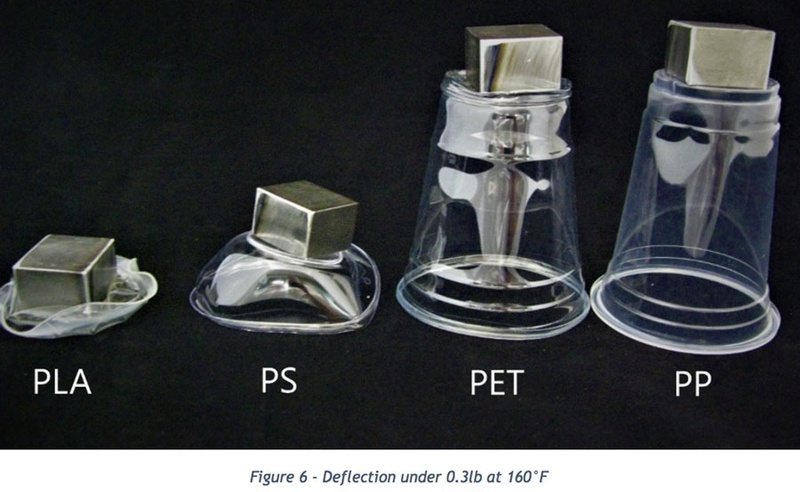 In the second test at 160°F, (Figure 6) the PLA cup completely flattened, the PS cup buckled and melted, and the PET cup melted at the top. The PP cup showed no response. 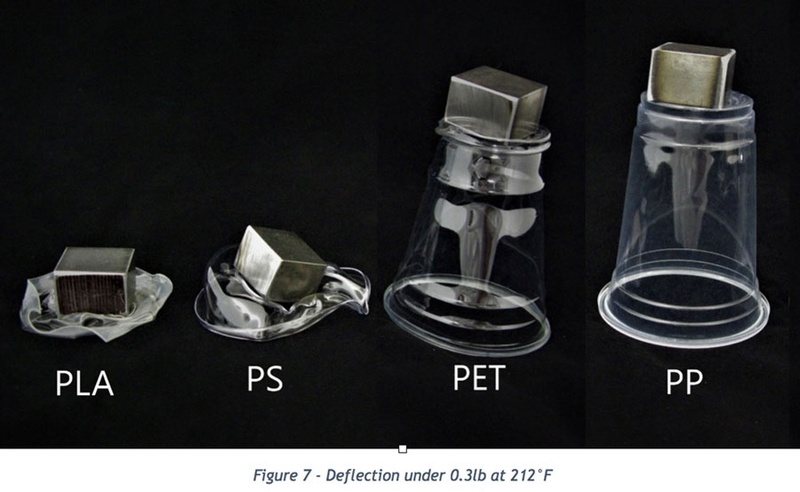 In the third test at 212°F (Figure 7), the PLA cup melted and flattened, the PS cup completely lost its geometry, and the PET cup buckled slightly at the top. The PP cup showed no response. The fourth test was conducted at 284°F (Figure 8). Both the PS and PLA cup completely flattened and lost all of their initial geometry. 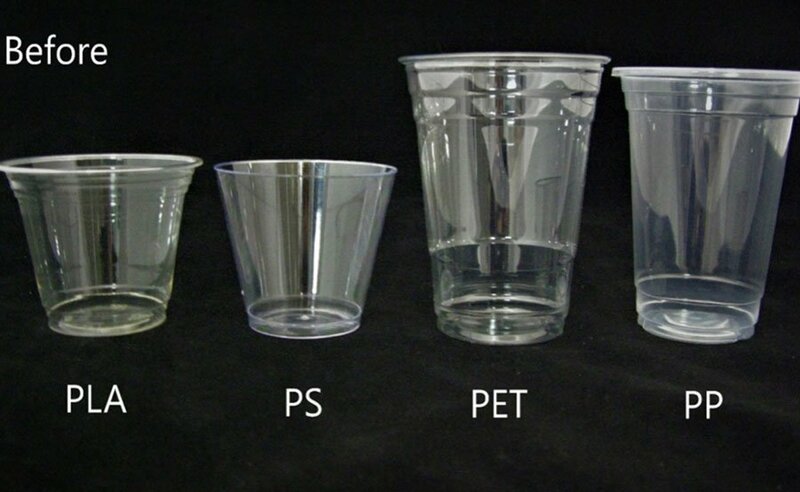 Both the PET and PP cups started to warp and deform. PLA continuously demonstrated its limitations throughout each exposure. Our test results confirm the supposition that PLA is not durable enough to be used in most consumer products. This leads to the question of how PLA will react to our long-term exposure tests subjecting the materials to direct sunlight, ocean water, soda, and natural compost. Stay tuned!